What is a succulent? A succulent is a plant that is able to store water in its leaves or stems, or in both areas. That’s a simple definition for a very unique group of plants. In the process of adjusting to adverse growing conditions, these plants developed intriguing textures, colors, and beautiful shapes. One thing you can always say about succulents is that they know how to conserve water. They have dramatically reduced their leaf surface area in order to cut down on water loss (plants lose moisture through their leaf pores). At the same time, they come up with excellent ways to store water in the leaves or stems when it happens to be available. They also developed big root systems so they can quickly absorb water when it is present. This gives these highly adapted species the ability to control the amount of water they actually use and the amount they need. The succulents also found other ways to minimize water loss. They often have protective coverings, such as scales, hairs, varnish, resin, or woody bark. Examples of these are the agaves, Dyckia, Fouquieria, and Yuccas. Given all these facts, this means that all cacti are succulents, for they can certainly store water. It turns out that cacti are only one family among the succulents. All cacti are succulents, but all succulents aren’t cacti. This simple rule is often quoted to help people understand the relationship between these plants. Most people know that cacti, which are succulents, have spines. However, some non-cactus succulents have prickles. Linnaeus created our basic system of botanical classification. In botany, the plants are classified by their reproductive features-and not by their physical characteristics that they may have in common. Succulents vary tremendously in size. The living stones (Lithops) are pebble-sized, while others may be over twenty feet tall. There are three major kinds of succulents, including the leaf succulents, the stem succulents, and a curious group known as the caudiciforms. 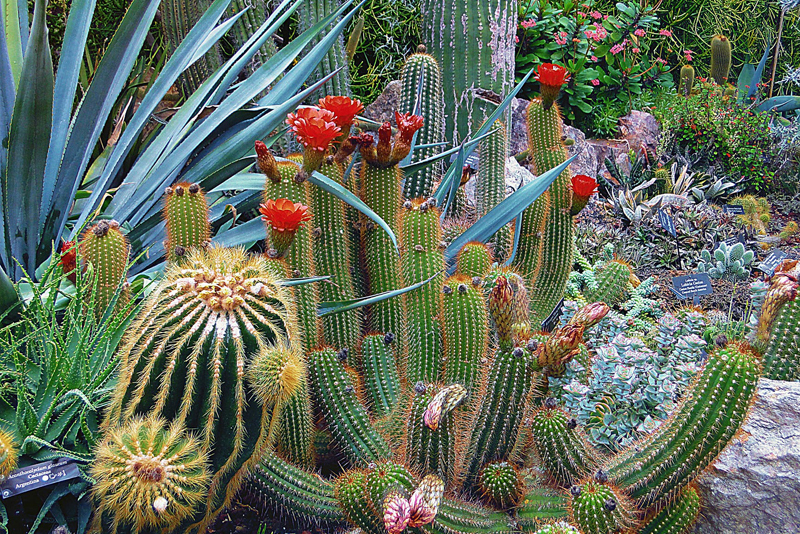 Examples of stem succulents include Euphorbia and the cacti. These tend to have few leaves with the stem modified to carry out photosynthesis. The best example of leaf succulents are the Aloes, Sempervirens, and Echeverias. These tend to have a small number of succulent, flat leaves that are often arranged in striking rosettes. The third major group is the caudiciforms. These have a swollen base, usually the lower part of the stem, where the plants can store water. Examples of these include the ponytail palm (Beaucarnia) and Pachypodium. Though the differences between these three types are fairly clear, some succulents may actually combine different characteristics from two of these categories. For example, the jade plant has both succulent leaves and stems. The world of succulents is a rich one, and they feature different specialized shapes. Take the living stones, for example. By becoming ultra-tiny and assuming the shape of pebbles, they are able to camouflage themselves so animals are less likely to eat them. Most of the plant may actually be out of view, for these are amazingly capable of pulling themselves into the soil to become less visible. Some species, such as the ice plants (Delosperma and others) are covered with crystalline substances that reflect the sun, and look like crystals of quartz sand. This serves as a form of camouflage in their native habitat. Of all the succulents, the windowed ones are probably the most unusual. These include the Haworthias. They have flat tops with a translucent window where the sun enters before it reaches the plant’s inner tissues. This provides the plants with extra protection against the drying sun. Most of the succulents evolved in warm tropical or sub-tropical areas. This means they aren’t hardy in cold climates. However, there are obvious exceptions, such as the garden sedums, Sempervivum, and some of the more hardy South African species of Delosperma, also known as the hardy ice plant.